The 3-ply I plied last Monday. I still have a bit of the purple roving to spin and then I’ll be able to finish plying the rest. You can find two more here and here. Feel free to save it to your own server if you’d like one! Although I haven’t been spinning much I have been knitting. I’ve finished a pair of socks. I admit that I didn’t blog about them at all, they just got listed in the sidebar. 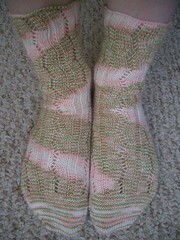 The pattern was the June Sockamania pattern, designed by Anni Design and the name is River Valley. The pattern is really pretty and very easy to remember. It was quite fun to knit. I’d definitely knit it again, although with more of a solid or semi-solid yarn. Sock #1 was knit between June 7 and 15. 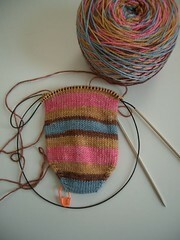 Sock #2 was knit between June 17 and June 23. I immediately cast on for an plain sock to carry around with me as my other sock currently on the needles is my Sockapalooza sock where the pattern demands a bit more of my attention.